If you use StatCounter on your website, a StatCounter analytics cookie is set in the browsers of people who visit your site. This cookie is used only to determine first-time and returning visitors and to estimate unique visits to the site. No personal information is stored in the cookie. Cookie duration is 5 years. This is the default situation. Your visitors can set their browsers to refuse StatCounter analytics cookies on your site (and all other sites which use StatCounter) on this page. 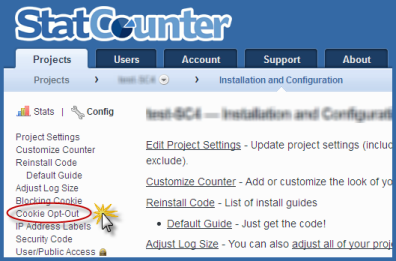 Go to the "Projects" tab of your StatCounter account. Click the wrench/spanner icon to access the configuration area of your project. Click "Cookie Opt-Out" in the left menu bar and follow the directions.